Second grade attendance all-stars, from left: Olivia Bennett, Hallie Shepard and Evelyn Gravely pose together in the Attendance All Stars photo booth during the monthly attendance celebration at Volney Elementary School. 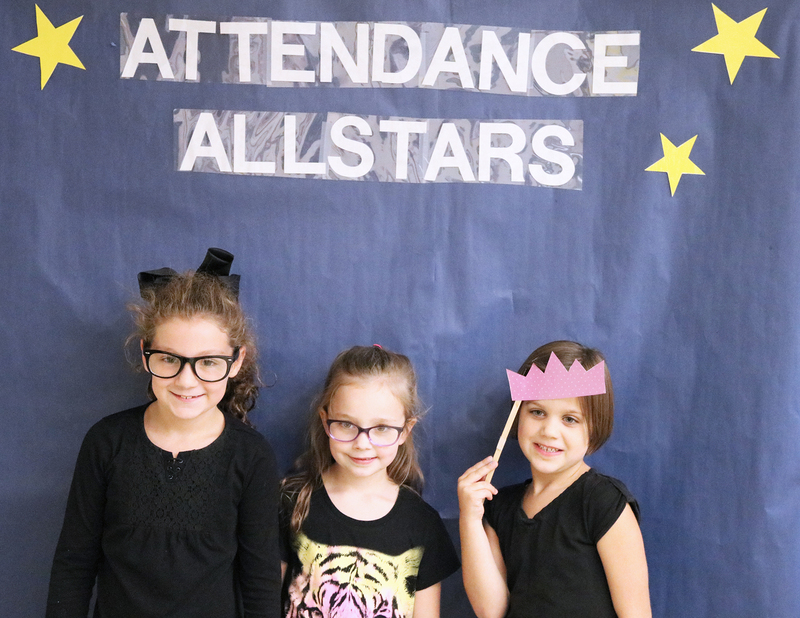 VOLNEY – Volney Elementary School students are ramping up their efforts to attend school all day, every day so they can be named monthly grade-level attendance champions. The friendly, competitive contest is a way to encourage students to be present so they can maximize their learning potential, according to Principal Todd Terpening. As the Fulton City School District works toward reducing its chronic absenteeism rate, Terpening said Volney can do its part by offering a small incentive for students to have stellar attendance. The monthly winner was the second grade team, which achieved an overall rate of 98 percent for September. Their prize was a special celebration during lunch. After they ate, they participated in a dance party, photo booth and mini ice cream party. “Attendance is important so you’re here to learn,” said second grader Tessa Morey. That kind of peer motivation is what Terpening hopes to see spread throughout the school. He said he is proud of all of the students throughout the entire school for achieving a building-wide attendance rate of 96 percent for September.